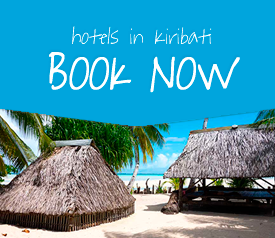 Looking after our natural resources, as well as our people, is of prime importance in Kiribati. One company that is proving that sustainable business can be competitive in the global marketplace is Atoll Beauties. The company has blossomed in recent years, thanks to the high quality of giant clams that they consistently produce and seamlessly distribute around the world. What really sets Atoll Beauties apart, is that they perfected the process of clam reproduction in partnership with local farmers. This strong relationship between them and the surrounding communities is a vital component of their business model and something that other local businesses should work towards. As the business develops, new hatcheries and ocean grow out systems are being established on the outer islands of Kiribati. Originally part of a pilot project, these giant clam mariculture farms were welcomed by the two villages on the island of Abaiang. The I-Kiribati people, who live on these remote atolls, are supplied with baskets of baby clams from 10mm in size and are responsible for keeping them suspended in fresh moving water and cleaning them once a week. Atoll Beauties then purchases them back after one year of growth, when the clams have reached approximately 40mm in size. In doing so, they provide much needed income for the local people while simultaneously encouraging them to participate in this sustainable practice which will not deplete their natural resources. Such was the dedication of the local residents that the company now plans to expand the popular social enterprise to some of the other island communities in Kiribati. 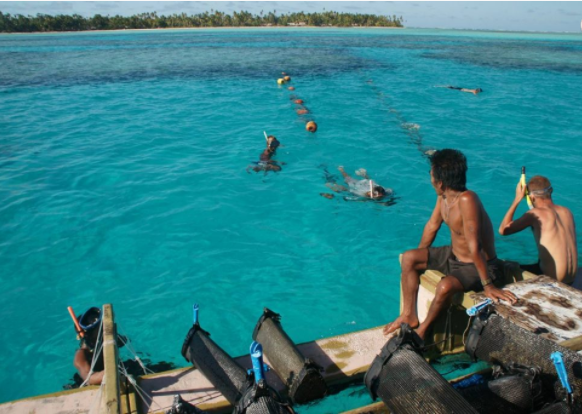 In addition to this, they have also built a second clam farm in North Tarawa. This new facility will employ women from the local community to operate and maintain the farm, as well as young men, who will be in charge of all underwater activities. The employment opportunities that business enterprises such as this bring to the outer islands of Kiribati have a meaningful and lasting impact on the economic development of these communities. The benefits will be reaped by all for years to come.